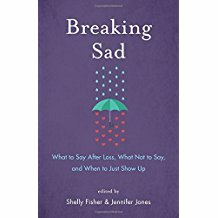 These two, Shelly Fisher and Jennifer Jones combined talents to produce a book about the etiquette of Grief: how to respond to those experiencing loss. To stories, anecdotes and poems from many people the authors asked four questions. The result is a book like no other, a book to help us navigate with compassion and grace the tricky moments of someone else's loss. Here is their interview.